For years, digital marketers have tried to make themselves as attractive as possible to Google and its ever-changing search algorithms. Search engine optimization (SEO) specialists have developed all kinds of tips and tricks for ensuring that their web content is ranked highly on search results. Here’s the problem: Google keeps getting smarter. As data-tracking and artificial intelligence technology get more sophisticated, Google’s algorithms are coming closer and closer to true, complete understanding of both the web content and the searcher’s intentions. One important, AI-fueled innovation is semantic search, which is prompting some marketers to turn away from often-used catchphrases like “keyword density” and towards a more holistic content strategy. Semantic search aims to improve the relevance of search results by analyzing the contextual meaning behind both the searcher’s query and the web content itself. Through topic modeling, concept matching, and natural language algorithms, semantic search achieves an enhanced understanding of the searcher’s intent, and can thereby deliver more relevant and personalized results. Semantic search helps Google identify lower-quality results that, in previous years, might have passed for relevant. Content creators who might have tried to “cheat” Google using methods like article spinning and keyword stuffing now face a variety of advanced systems which use term frequency and predetermined weighted relationships to determine quality. Basically, search engines know what words statistically occur together and can make semantic correlations which can condemn irrelevant, although keyword-dense, content to the bottom of the search results. How does Google do it? By leveraging enormous amounts of user data from past search results to create entity-based search taxonomies. Basically, search engines can represent entities (people, places, things, concepts, etc.) 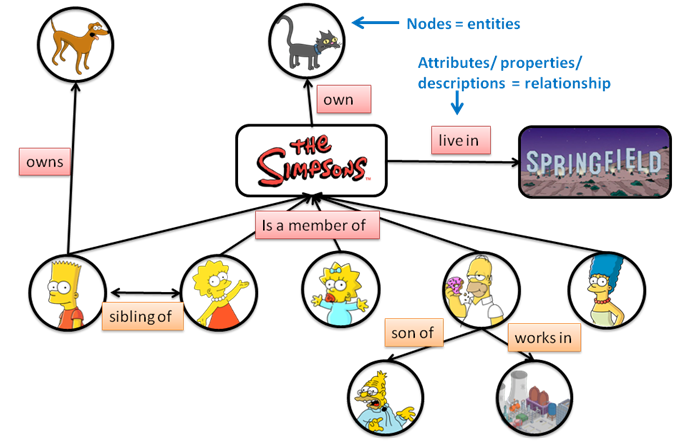 as nodes and connect these nodes via semantic relationships. The diagram on the left shows a simplified version of what an entity-based taxonomy could look like. And since Google has access to essentially limitless information about user’s past behavior and preferences, it can draw conclusions about entities and structure the search results accordingly. For example, a simple search for an actor’s name could bring up a number of different categories of results: demographic information, news, bio, pictures, colleagues and associates, social channels, etc. By analyzing data from semantically-similar queries, search engines have a better idea of what a searcher might want to click on. What does semantic search mean for SEO? Become an authority. Figure out what you want your company to be known for, and then work to prove yourselves experts in that field. Providing value to searchers should be the most important goal when writing new content. Look at your competitor’s web content and see how they are establishing themselves as experts. Structure sentences clearly and make use of bullets and lists. Content should use natural language—if you’re not sure, try reading your content out loud. If it sounds weird out loud, it will sound weird on the screen. Structure your sentences simply and clearly in Subject-Predicate-Object form, to make it easier for search engines to parse the information. Google also seems to prefer numbered lists or bulleted instructions which clearly answer questions. Be strategic with internal linking. Linking to other sections of your site within a piece of web content is an important way to illustrate topicality and help users navigate your site. Of course, don’t link just for the sake of linking—identify thematically relevant opportunities to link to target landing pages. For more information on ZAG FIRST Digital Marketing, contact us.